Michelle Hernandez, shareholder at Modrall Sperling, will serve as Chair of the 2019 International Association of Defense Counsel (IADC) Convention. Her husband Jon will serve as Co-Chair. Michelle is an active member of IADC. She serves as a member of the IADC Diversity and Inclusion Committee, and is State and Regional Chair of its Membership Committee. 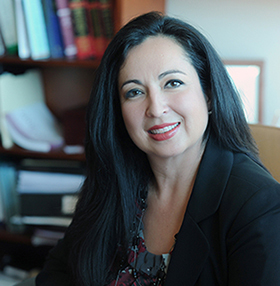 In addition to her work with IADC, Michelle is Chair of the Albuquerque Hispano Chamber of Commerce (AHCC) and Regional President of the Hispanic National Bar Association (HBNA) where she has been a member since 1997. She worked closely with the HNBA and AHCC to book a large conference in Albuquerque, set for 2019. Jon and Michelle have both previously served as tennis chairs for IADC. They have been married for 16 years and have two children, daughters Mia, age 14, and Lena, age 11.